It’s been a crazy week round here. Actually, the last few weeks months have been crazy. Whoever said that starting a blog in the first year of your PhD was a piece of cake was… actually, I doubt anyone has ever said that. Because, honestly, who could possibly be insane enough to do it? That’s not to say this blogging thing isn’t rewarding, interesting and utterly exhilarating. I’m baking things I would never have attempted even just a year ago, I’m learning new photography tricks pretty much every day, and the latest adventure have been recipe videos. But, without doubt, the best part have been your comments. 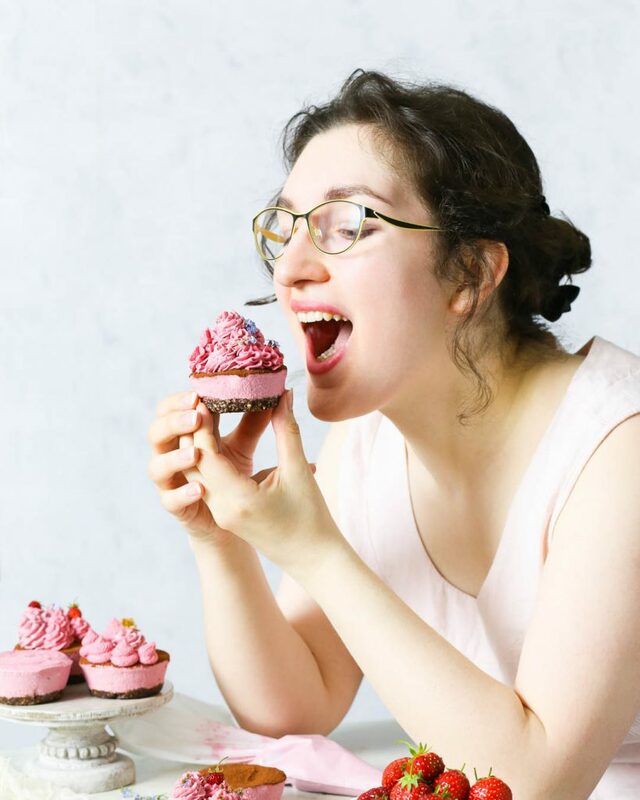 Be it on the blog, on Facebook, Pinterest or Instagram – reading about how you’ve won a local bake off with my cookie bars, how you got a picky child to eat something new with my paleo brownies, how you made another one of my recipes and it’s been a total hit… that means so so much. Anyway, we were talking about crazy weeks. We all know them. And when they happen (which is way too often) we don’t want to spend hours in the kitchen. If we want a treat (and we do), we want it now and with no fuss. 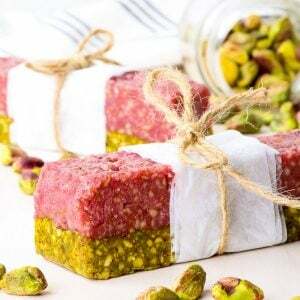 This is where these pistachio raspberry homemade energy bars come in. 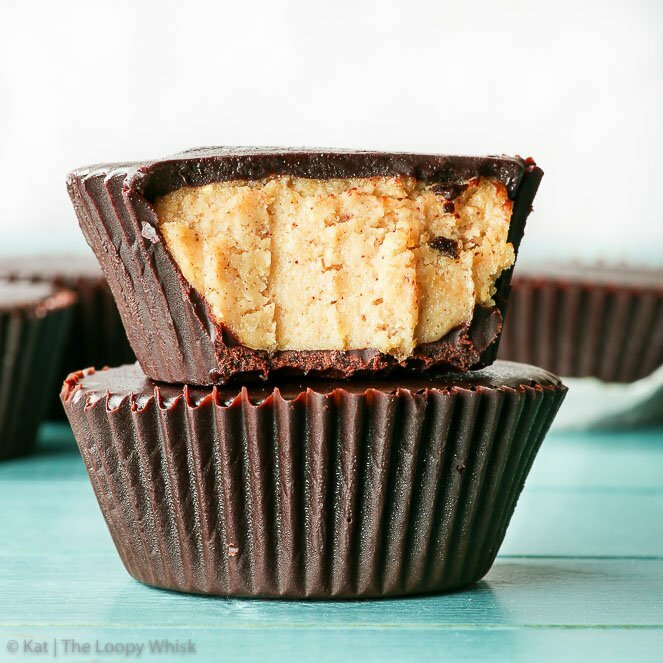 Easy to prepare in advance and ideal to have on hand for that afternoon energy slump, they taste like dessert while being a perfect quick healthy snack. 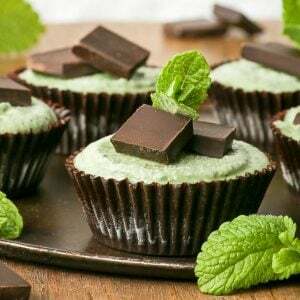 They are super quick and easy to whip up, with only 6 ingredients and 20 minutes of active preparation time. 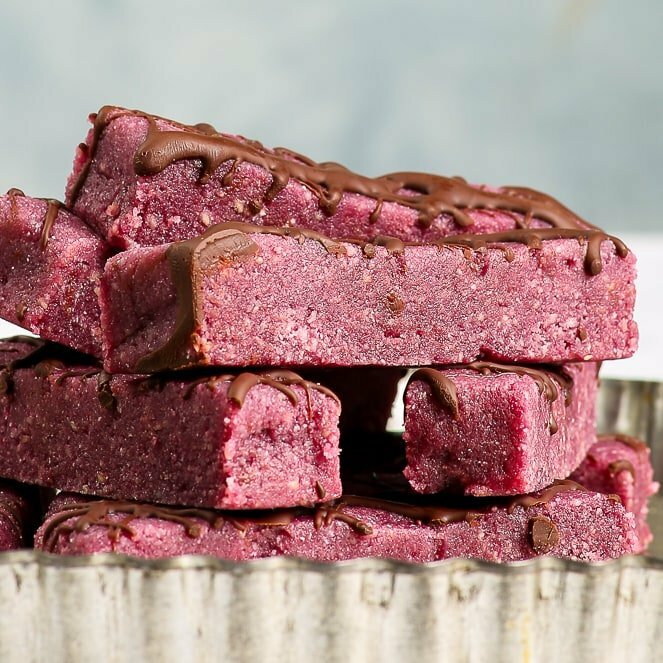 These homemade energy bars are also gluten, dairy, egg, soy, peanut and refined sugar free, as well as vegan and paleo – so you can easily enjoy them regardless of what kind of health journey you are on. 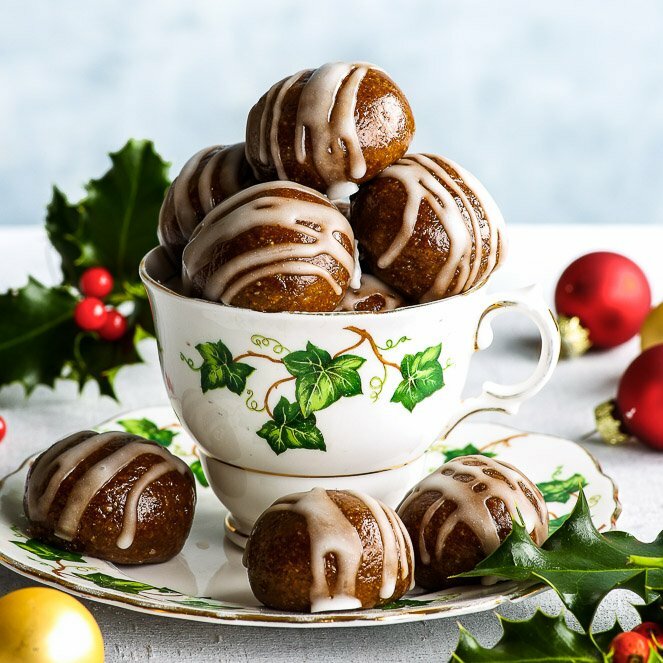 That’s not to say that they aren’t terribly decadent and that every bite isn’t a mouthwatering taste explosion. Because they are and it is. 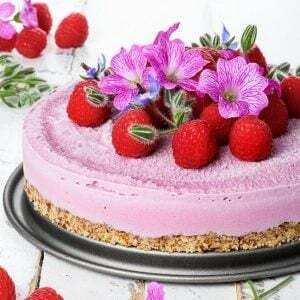 The pistachio-raspberry flavour combo is pretty much a no-brainer, and the sweet butteriness of the pistachio layer is balanced perfectly by the refreshing (slight) tartness of the raspberry layer. 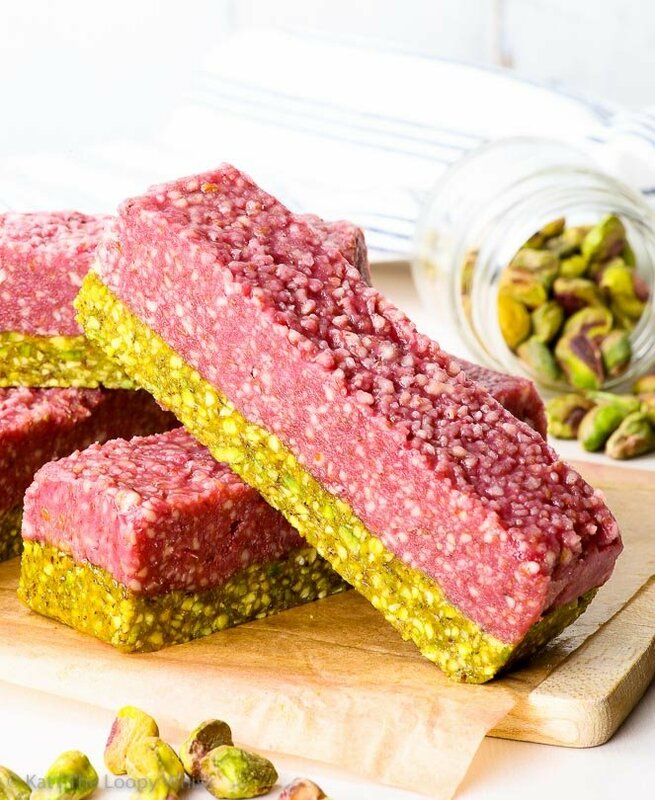 Also, the colours of these homemade energy bars are amazing! If you thought the pictures exaggerate the colours: they really don’t. And it’s all with natural, wholesome ingredients – no artificial food colourings here! 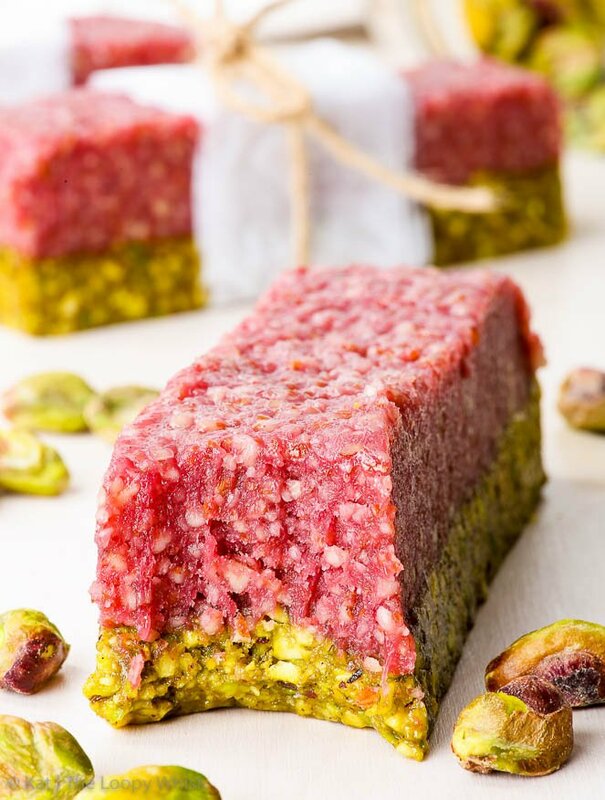 So if your week has been as crazy as mine, or if you expect the next one to be a busy nightmare – make these pistachio raspberry energy bars. And… enjoy. Line the container of choice with baking/greaseproof paper. In a bowl, mix all the pistachio layer ingredients together until you get a homogeneous mixture. The final consistency will be cookie dough-like. Press the mixture into the lined container until you get a firm, even layer. In a bowl, mix all the raspberry layer ingredients together until you get a homogeneous mixture. The final consistency will be runnier than that of the pistachio layer. Transfer the raspberry mixture on top of the pistachio layer, and smooth out the surface with a spoon or spatula. 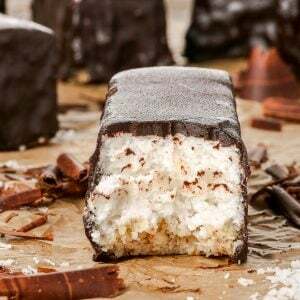 Once the energy bar block has firmed up, remove from freezer and cut into even pieces of desired size. 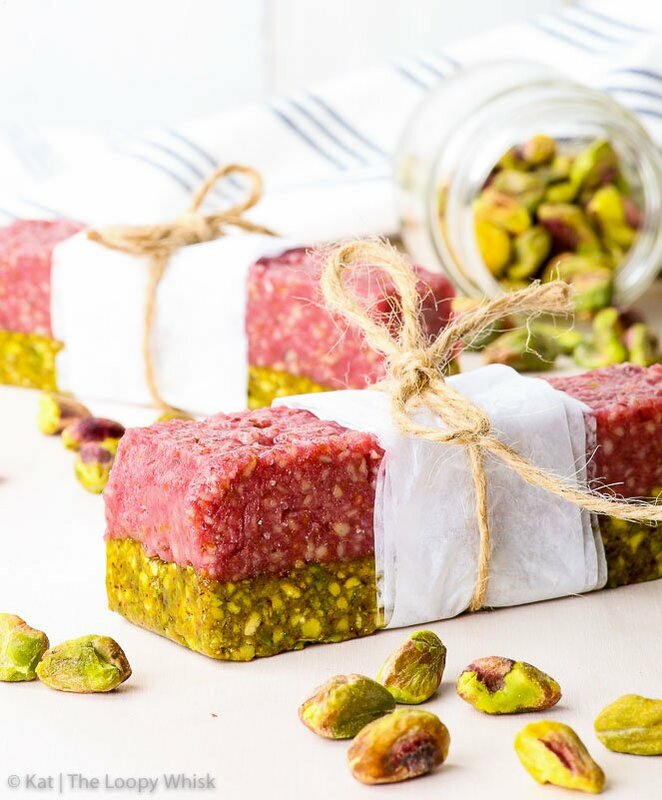 The pistachio raspberry energy bars keep well in a closed container in the fridge for about 1 week, or in the freezer for 2 - 3 weeks. Note 1: To make the raspberry reduction, start with 1 1/2 cups (190 g) fresh or frozen raspberries. In a small saucepan, cook the raspberries on medium-high heat until they have released their juice and part of the liquid has evaporated. Pass the raspberry mixture through a sieve to remove the seeds and skin. Return the raspberry juice to the saucepan and cook further until it has decreased in volume to about 1/3 cup (about 60 g). 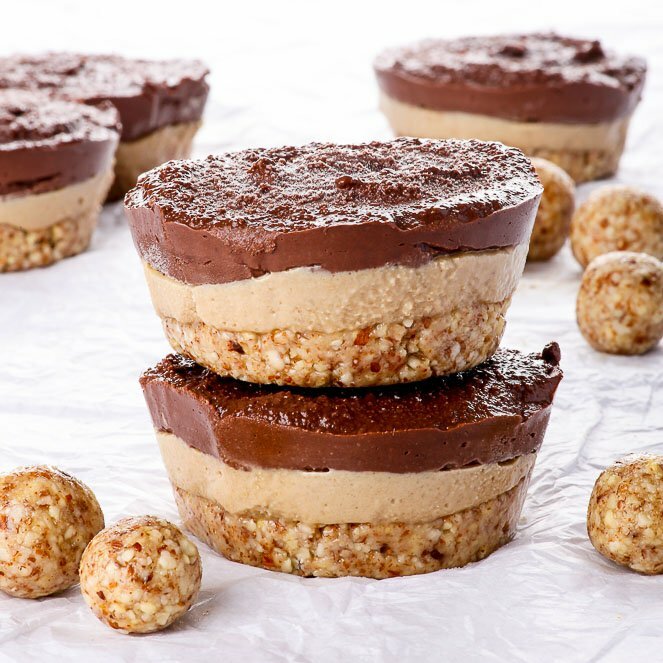 Looking for more no bake treats? You’ve come to the right place! These look incredible! Going to try them ASAP! Could I use ground almond meal that I used to make almond milk?